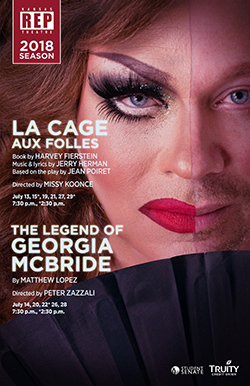 Kansas Repertory Theatre performances of “La Cage aux Folles” are at 7:30 p.m. July 13, 19, 21 and 27 and 2:30 p.m. July 15 and 29. Performances of “The Legend of Georgia McBride” are at 7:30 p.m. July 14, 20, 26 and 28 and 2:30 p.m. July 22. The performances will share a set in the Crafton-Preyer Theatre at Murphy Hall, and some of the performers have also been cast in both shows. “La Cage aux Folles” was written by Harvey Fierstein, with music and lyrics by Jerry Herman, and is directed by Missy Koonce, who has directed for the Unicorn Theatre, the Coterie Theatre, the Living Room Theatre and many others in the Kansas City area. “The Legend of Georgia McBride” was written by Matthew Lopez and is directed by Peter Zazzali, the artistic director for Kansas Repertory Theatre. 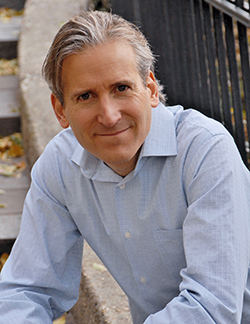 Zazzali, who is also an associate professor at KU’s Department of Theatre, said he wants to remind the community that these stories will be brought to life by a company of mostly professional actors and that as part of KU, the Kansas Repertory Theatre embraces the idea of diversity, equity and inclusion. 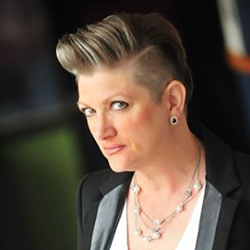 Missy Koonce has been a bar owner, cabaret singer, theatre producer, actress, choreographer and director. She wore many of these hats with Late Night Theatre and the Coterie Theatre. Most recently, she directed “Chainsaw, the Musical” for Kokopelli Theatre Company, “Young Frankenstein” at the White Theatre and “Milking Christmas” at The Living Room Theatre. Koonce’s credits also include co-directing and choreographing “Batboy,” “Heathers” and “Priscilla: Queen of the Desert,” directing “Hands on a Hard Body” and “Men On Boats,” and performing in “The Laramie Project,” “Hedwig,” “bare” and the one-woman show “Loving Lucy” at the Unicorn Theatre, as well as “Pride & Joy” and “Auntie Mame’d,” which were produced by Kansas City Artists Against AIDS. Zazzali, who most recently played Gabriel York in the University Theatre’s production of “When the Rain Stops Falling,” has acted and directed in more than 150 productions with institutions such as the Acting Company, Guthrie, George Street Playhouse, Western Australian Academy for the Performing Arts, Queensland University of Technology, Kansas City Actors Theatre, Actors Repertory Theatre Luxembourg, NJ Repertory Theatre and the New Jersey, Texas and Utah Shakespearean festivals. He is a member of Equity, SAG and SDC. Jake Fisher, a nationally recognized USISTD certified dance instructor from Lawrence, is the choreographer. Ryan McCall, a KU staff member and professional musician, will serve as musical director. Tickets for the Kansas Repertory shows go on sale June 13 at KU ticket offices and online at www.kutheatre.com. Tickets will also be available by calling the University Theatre, 785-864-3982, and the Lied Center, 785-864-ARTS. Tickets are $25 for adults, $20 for senior citizens and KU faculty and staff and $10 for KU students and children. All tickets are general admission. Kansas Repertory Theatre is an arm of the University Theatre. Its mission is to provide the Lawrence community the unique opportunity to see professional repertory theatre each summer. It includes professional actors, graduate students and other performance students from national recognized training programs, as well as a select group of KU students. The productions share the same casts but are distinguished by designs, directorial concepts and texts.